Just Genesis : Where Did Animal Sacrifice Originate? Where Did Animal Sacrifice Originate? What is the point of origin of animal sacrifice? 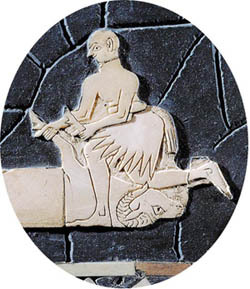 In "The Origin of Israelite Sacrifice" in the November/December 2011 issue of Biblical Archaeology Review, William W. Hallo, former Yale professor, attempts to answer that question. Hallo insists that the practice comes from the much older Mesopotamian civilization. Likewise Peter Leithart considers that Ur might be the point of origin. At First Things he wrote, "What are the chances that someone sometime in nearly every ancient culture decided that killing animals was a good way to worship their gods? What are the chances that this would be a near-universal practice without any tradition, any traditio/handing-over, of sacrificial rites? Aren’t the facts much better explained if we assume that there was mutual interaction, cross-fertilization, borrowing and mimicry, perhaps an Ur-sacrifice and an Ur-sacrificer?" Both men have fallen in the common trap of beginning the story with the calling of Abraham in Genesis 12. Yet Genesis 4-11 makes it clear that Abraham's ancestors were Nilo-Saharans and it is there that we must look for the antecedents of animal sacrifice. This civilization to which Hallo and Leithart refer was essentially Kushite and the Kushites were Nilo-Saharans. Genesis 10 tell us that Nimrod, the son of Kush, moved into the Tigris-Euphrates Valley and established a kingdom there. He brought with him the practice of the sacrifice of rams, bulls, and sheep. Abraham is a descendant of Nimrod. The sacrifice of animals was done by priests and the oldest known caste of priests is that of the Horites who can be traced back to Nekhen in the Sudan (4000-3000 BC). Horite priests had shaved heads such as shown (above) in this third-millennium B.C. Mesopotamian mosaic. Moses' half-brother Korah was a Horite priest. His name means 'shaved one." Compare this image to the one below of an Egyptian priest or harwa. Har-wa means "Horus rules the waters" (or rules universally). 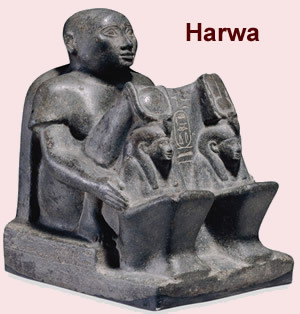 Harwa or Arwa always refers to the priestly role. In Hausa, for example, the word arwa refers to the prediction of the future done mainly by priests in ancient times. The Horites spread their religious practices and beliefs from ancient Kush to Mesopotamia and beyond. The oldest fire altars were falcon shaped (shown below). The falcon was the totem of Hor/Horus, who was called "Son of God." This is why the Shulba Sutras state that "he who desires heaven is to construct a fire-altar in the form of a falcon." At the Harappan water shrines of Kalibangan and Lothal, numerous fire altars have been discovered. The Dravidian word Har-appa means "Hor is father." Here is further evidence of the spread of Horite religion from ancient Kush to Pakistan and India. The Nilotic or Kushitic religious practices diffused through the agency of Horite ruler-priests who controlled water systems at a time when the Sahara, Mesopotamia, southern Pakistan and southern India were wetter. These ruler-priests are called Horites because they were devotees of Horus, the divine son by whose pattern Abraham's descendants would recognize Jesus' true identity. The Horite Hebrew are called Hapiru or Habiru in ancient texts. These words appear to be related to the Arabic yakburu, meaning “he is getting big” and to the intensive active prefix: yukabbiru, meaning "he is enlarging." Likely, this is a reference to the morning ritual of Horite priests who greeted the rising sun with prayers and watched as it expanded across the horizon. This is the origin of the morning ritual whereby the sun is blessed daily in every devout Hindu home and the Jewish Sun Blessing ritual (Birkat Hachama) that is performed every 28 years. The oldest known center of Horite Hebrew worship is Nekhen (Hierakonpolis) on the Nile. Votive offerings at the Nekhen temple were ten times larger than the normal mace heads and bowls found elsewhere, suggesting that this was a very prestigious shrine. Horite Hebrew priests placed invocations to Horus, the son of God, at the summit of the fortress as the sun rose. The twin shrine cities of Nekhen and Nekheb are mentioned in the Ancient Pyramid Texts which also speak of Horite mounds (Utterance 308), the son of God who tramples the serpent (Utterance 378), and of the resurrection of the dead King (Utterance 373). In the ancient world, a temple was considered the mansion (hâît) or the house (pirû) of the deity. The shrines and temples were aligned to the rising of the Sun and among the Dravidians were called O-piru, the O symbolizing the Sun. 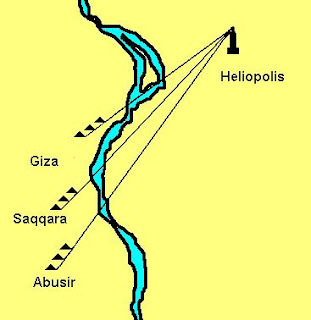 Heliopolis (City of the Sun) was on the east side of the Delta. Joseph was married to a daughter of the priest of Heliopolis (Biblical On). Hathor, the virgin mother of Horus, had her principal temples in Dendera and Memphis to the south of Heliopolis and on the west side of the Nile. The principal temples of Horus were further south in Nekhen and Edfu, on the west side of the Upper Nile. The pyramids at Giza, Saqqara and Abusir were aligned Heliopolis. Recently twin pyramids have been found in Zinder, Niger. They reflect the Nilo-Saharan roots of the Abrahamic faith. The sacrifice of animals among Abraham's Horite Hebrew ancestors does not appear to have been to appease God, nor to offer food to God. It appears to be about the blood itself which was the symbol of life, regeneration and healing. Blood is the substance associated with this priesthood. In this context, blood is a purifying agent when offered by a pure priest. The Hebrew root thr = to be pure, corresponds to the Hausa/Hahm toro = clean, and to the Tamil tiru = holy. All are related to the Dravidian tor = blood. The Hebrew priest was to be pure (w'b) before entering the temple. Their purification involved shaving their bodies and heads. Korah, Moses' half-brother, was a priest. His name means "shaved head" and according to Numbers 16:17-18, he carried the incense censor. This suggests that kor and tor are probably cognates. Here we find a very early connection between blood, purity and holiness. Dr. Margaret Barker makes a connection between purity and healing in her article Atonement: The Rite of Healing. She writes, "Atonement translates the Hebrew kpr, but the meaning of kpr in a ritual context is not known." However, in a paper on The Temple Roots of the Liturgy, Barker explains that kapporeth is "the place of atonement in the temple, where the Lord was enthroned." If the antecedents of Judaism are found among Abraham's Horite Hebrew ancestors we do well to look at the Ancient Egyptian and Nilo-Saharan languages for a clue to the meaning of kpr. The pr likely refers to piru, which is temple or shrine. The k likely refers to ka, which means spirit, soul or deified ruler. Atonement would then pertain to the divine ruler-priest standing in the most holy place. Surely, this is a Messianic image. Isaiah 6:1 - "In the year that King Uzziah died, I saw the Lord, high and exalted, seated on a throne; and the train of his robe filled the temple." Hebrews 10:12 which speaks of how the priest stands at the altar until he has completed his task. "But when this priest had offered for all time one sacrifice for sins, he sat down at the right hand of God." Outstanding article! You've given me material to delve into here. Please know that your hard work is very much appreciated! Just a quick thank you for the thorough research and clear reasoning here. Excellent. What about Able's offering? Would that be the first and how did evolve into animal sacrifices among the nations. I'm trying to tie some loose ends together. Abel's sacrifice was according to the sacred tradition that he received from his ancestors who lived long before him. His brother, Kain, was a city builder (Gen. 4:17) and one of his descendants was Tubal-Kain, a metal worker in the Early Bronze Age. Animal sacrifice is one of the distinctive practices of the ruler-priests known in the ancient world as 'Apiru, Ha'piru, Ha'biru or Hebrew. Thank you for such a clear and scholarly analysis of an often emotive subject. Very useful.